I’ve shared several ruffled fabric wreaths that were made with a single piece of fabric. 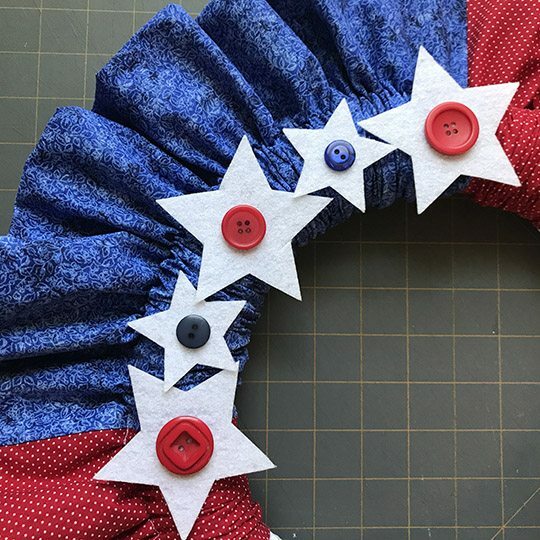 For this patriotic version, I pieced the ruffle fabric out of red, white and blue scraps and added felt embellishments to create a stars and stripes effect. 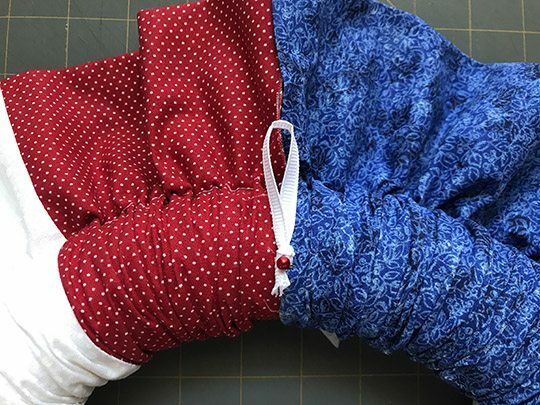 There are a few more seams involved, but this is still a project you can easily create in an afternoon. Sew the sections together along the long edges, right sides facing, using a ¼” seam to create one long strip. Start with the blue section, and alternate the red and white sections. Press all the seams toward the red sections. Turn the short ends of the assembled strip under ¼” and press to hide the raw edges. Fold the strip in half, right sides facing and matching the long edges. Sew along the long edge to form a long tube.rm a long tube. Turn the tube right side out and press. 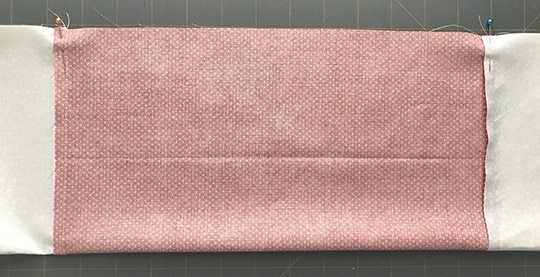 I found it easier to press twice: Once with the seam in the center so I could get it nice and flat, then again with the seam pushed to one side as shown below. 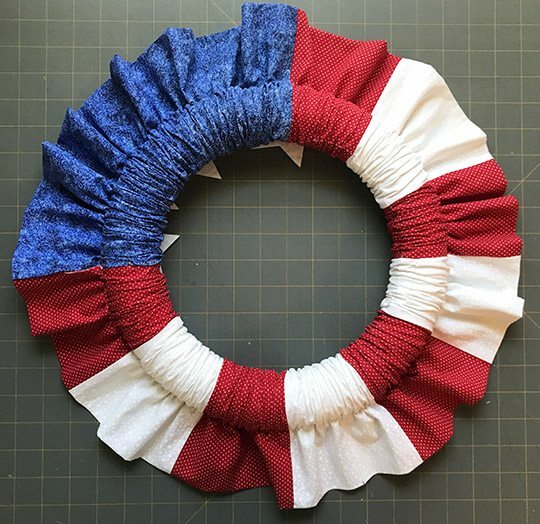 To form the casing for the wreath form, measure over 3” from the folded edge (not the seam edge) of the tube and sew a straight line all the way down. To keep the seam straight, I stuck a piece of washi tape on the machine bed as a guide. 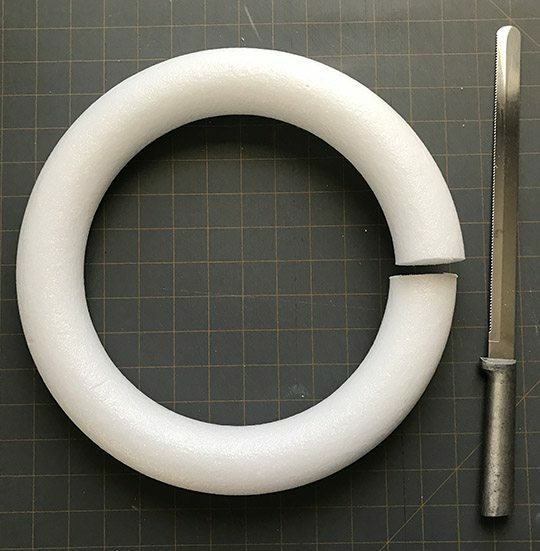 The folded side of the tube is the casing for the wreath form, and the seam side of the tube will form the ruffle. (Using the seamed edge for the ruffle helps it keep it’s shape when the wreath is hanging.) Slide the tube onto the form, beginning on the blue end so the seams will be facing toward the other end of the tube. This prevents the wreath form from getting caught on the seams as you slide the fabric around. Once all the fabric has been worked onto the wreath form, glue the form back together with hot glue. To reinforce the join, you can also wrap it with a little clear packing tape. Arrange the fabric so the ruffle is even all the way around and the blue fabric covers ¼ of the wreath. If needed, you can push a few straight pins through the fabric and into the wreath form to keep the sections in place. 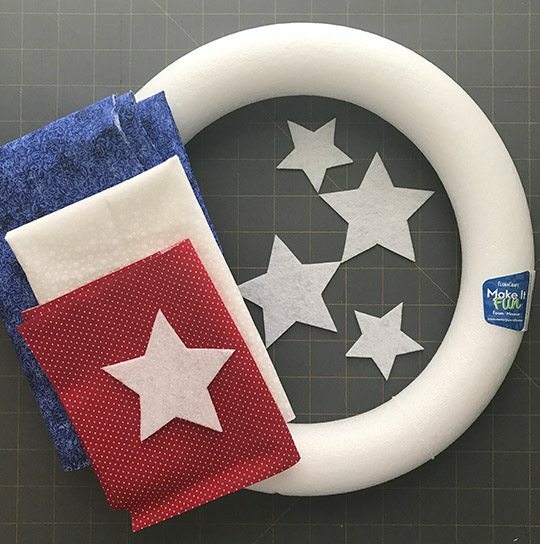 Cut out stars from white felt and hot glue them to the blue section of the wreath. Embellish the stars with buttons or other decorations if desired. 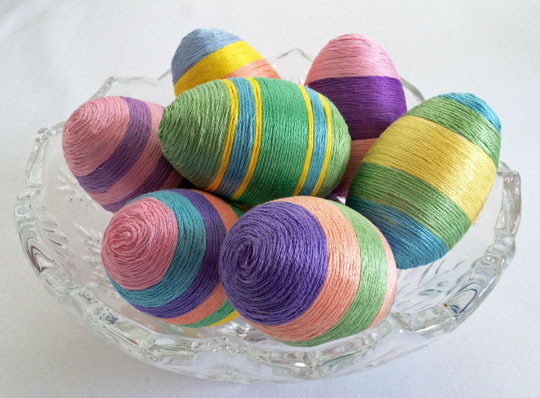 Fold a short piece of ribbon in half and tie the ends in a knot. Push a pin through the knot and into the back of the wreath form to create a hanger. 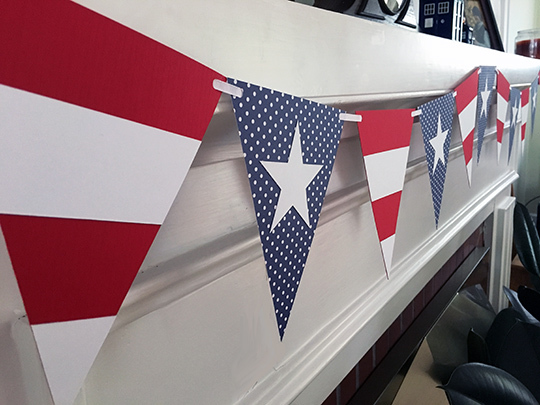 Hang it up and enjoy your handiwork! Very clever! 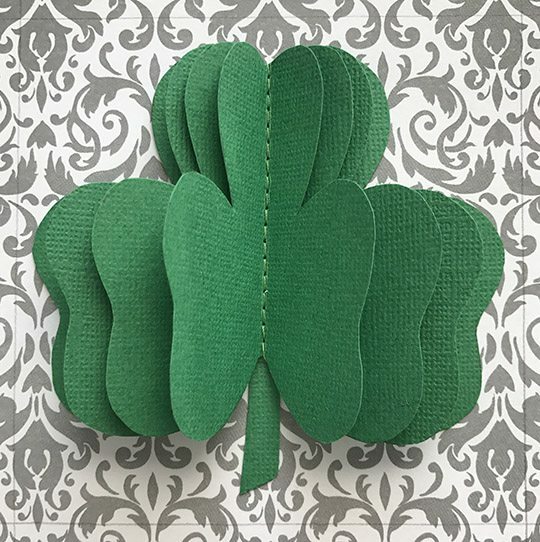 I clicked on your post thinking it might be a papercraft! Thinking I might adapt it to a smaller format with paper. Thanks for sharing. Hmmm…pleated paper with an embroidery hoop for base might work. I just might have to try that! I love this wreath! Anything that has ruffles and is festive for the holidays is perfect in my book! I am sending this project to my mother in law in hopes of scoring a new decoration for my house. Thank you for sharing! 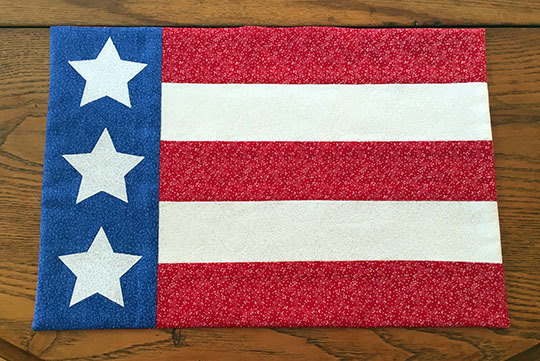 You’re very welcome – hope your mother-in-law will make one for you! It looks lovely, you did a wonderful job!thank you for sharing at The Really Crafty Link Party this week. Pinned! 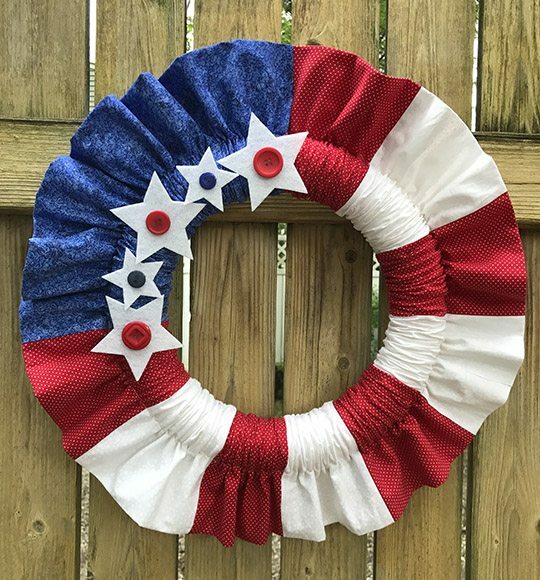 Lovely 4th of July wreath. Thanks for joining us at the Inspiration Spotlight party. Pinned & shared.